July 7, 2015 July 7, 2015 backlogadventures Uncategorized	Arkham Knight, Arts, Backlog Adventures, Batman, Batmobile, Gaming, Stealth Car Game Play Is Stupid, Warner Bros., Will H.
A good trilogy is considered the holy grail of just about every entertainment medium. This benchmark is a difficult mountain to climb, as very few franchises and properties ever reach that goal. For every success story such as the original Lord of the Rings or Star Wars trilogy, there are myriad failures. In gaming, this is an even more daunting task. By the third game in a series, expectations have risen. Game play and art design are expected to progress in between the first and third releases. Burn out can easily set in. More to the point, hardware generation caps can occur, which may leave a development team scrambling to learn the ins and outs of new hardware while also trying to place the finishing touches on that pivotal third game. In other words: Game development is tough, as is trying to innovate in a medium that expects something new each time. Rocksteady is in the not-so-envious position of finishing their Batman: Arkam trilogy on a new console standard, all while facing flack from two sides. Recent criticism of their publisher, WB Games, as well as a prequel in the series that was handled by a secondary team has left fans and critics weary with regards to Arkham Knight, Rocksteady’s attempt at capping the trilogy. Arkham Asylum was a breath of fresh air for an IP that had long meandered and suffered the slings and arrows of poor games. Placing players in the cape and cowl of a Batman that was as much stealth predator as he was Spartan-like warrior, Asylum proved the Caped Crusader was worthy of the starring role in a quality, engaging story-driven title. Surprising just about everyone with rave reviews, Asylum set a new standard for Batman in gaming. Rocksteady would challenge expectations again with the second game in the series, Arkham City, this time adding an open world in the form of Gotham in a state of lock down. Expanding the universe into an open world changed the dynamic found in the first title. Less about progression via new items and abilities and more focused on exploration, story beats, and more detective work, Arkham City received ample praise. The biggest change between the two games was the ability to traverse the city via grapple gliding, as well as opening the game’s side quests up as full, encapsulated stories. Rocksteady has once again attempted the challenge of innovation. Heading into Arkham Knight, the developer was heavily levying the iconic Batmobile as a game play mechanic. It wasn’t until just before E3 that players would get an idea of the scope of game design involving the vehicle. As it turns out, Arkham Knight is almost completely about the Batmobile, to the point that it makes you wonder how Batman has ever been able to get anything done without it prior to Arkham Knight. By the end of the game, I was half expecting Bruce to not be able to reach a high shelf in his kitchen without his trusty metal steed. 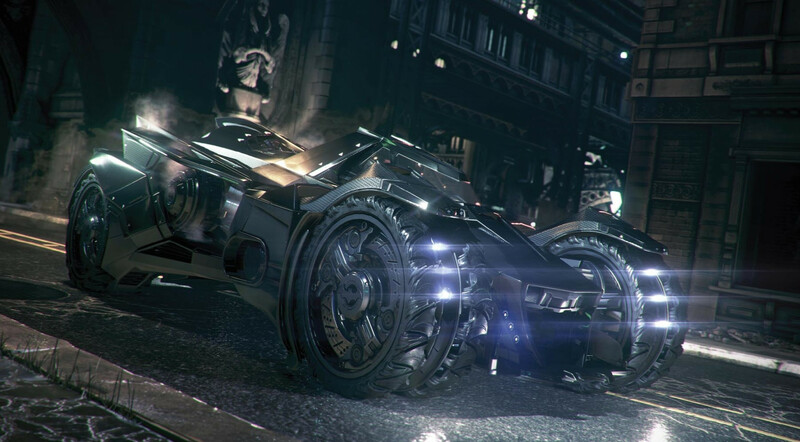 Players and critics have been split on the Batmobile and its “jack of all trades” role in Arkham Knight. One minute, the rolling tank is purely a method of transportation. At the drop of a hat, players transition into rolling vehicular combat in a battle tank mode that is activated by holding down a trigger button. After that, you may very well be expected to traverse, fly, and platform across Gotham rooftops. Even later than that, your car will be doing its best Metal Gear Solid impersonation. It’s a lot to take in, and for the most part the Batmobile works. When it doesn’t, the car brings the game to a grinding halt. I give Rocksteady credit: I was completely ready to hate the Batmobile stuff upon hearing other critics discussing their time in car. Early word from my unimpressed peers was that the combat felt weird and that the game was forcing the vehicle to be used in spite of the story. Upon getting my hands on the game, I have to say that I really enjoy the creativity that went to working the Batmobile into the core game play. For me, the Batmobile supplements and augments many mechanics that are already in the game. Sometimes it is more feasible to use the car to travel around Gotham’s boroughs, while other times the grappling method is the way to go. The Batmobile’s use in puzzles and platforming segments is where the mechanic really began to click for me. Early on, Batman must invade Ace Chemicals but cannot progress forward without finding a way to get the Batmobile into the compound. Instead of a brute force approach of blasting the door down, the game requires players to remotely control the Batmobile in a series of rooftop-jumping platform segments that involve precise movement and use of the car’s power winch. Using the winch, you’ll lower ramps, activate switches, and overcharge generators. That scene at Ace Chemicals very much reminded me of the feeling I had upon seeing Batman Begins for the first time and seeing the Tumbler Batmobile jump from roof to roof in one of the film’s big action sequences. It felt big, dumb, and amazing. In many ways, it was one of those moments that put me into a bubble as I sat in awe of the fact that I really felt like Batman. This moment was very similar to the first time you grapple across Arkham Asylum in the first game of the series. Likewise, I enjoyed the breakneck speed of the driving and chase sequences. These chase scenes felt like they were straight out of the Burnout racing series, which is about as high of a comparison as I can make. I’ve always had a soft spot in my heart for the destruction and speed of Burnout, and using the Batmobile to side-swipe and blast enemy militia always felt like the best kind of game of cat and mouse. I am even willing to defend the battle tank mode sequences, which is where the vehicle-focused game play begins to suffer. Instanced waves of enemy drone tanks will swarm upon Batman, with the only way to clear them being activation of the car’s battle mode. 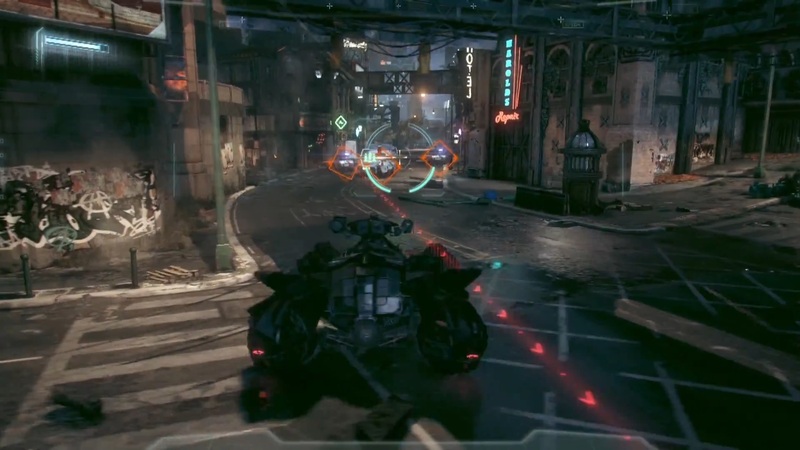 In this mode, the car strafes and burst-dodges like a character in a third person shooter, with a gun, a canon, and a bevy of special weapons along for the ride. These segments will completely depend on whether or not you’re the type that enjoys close combat that requires you to always be moving and shooting while still requiring a steady hand. These segments aren’t brainless exercises in blowing things up. Knowing when to attack and when to stop moving is the name of the game. Where these segments falter and almost completely derail the game are the stealth battles. Yes, you heard right: For some reason, someone thought that the idea of sneaking and stealthing around the slums of Gotham was a dandy idea. In these segments, heavily armored tanks will roam around an area, all with enough firepower to blow up the Batmobile in a few hits. The only way to combat these tanks are to quietly work your way behind the tanks, target their weakness by keeping the tank in your sights for a number of seconds, firing, and then escaping as you alert your presence to the rest of your enemies. These segments are tedious, tiring, and stressful in a bad way. More to the point, these stealth battles pop up more than a few times, including in a few boss fights late in the game. One of the last vehicle boss fights involves Batman fighting the Arkham Knight — in his own decked out mega tank — complete with a rail gun. In this fight, you must sneak around and blow out four points on the tank. After each point is destroyed, the Knight will auto-target the Batmobile, chasing you down and locking on with a laser weapon that is immensely powerful. Given the Knight’s speed and power in comparison to the Batmobile’s inability to take a hit or easily shake his opponent, this fight brings the main quest line to a grinding halt. I spent an hour on this fight, figuratively bashing my head against the wall, all in hopes that I could beat this monstrosity and never, ever do it again. The stealth sequences are the rare black mark on the Batmobile in Arkham Knight. Besides such a massive misstep, I found the mechanic to be engaging and providing sorely needed variety. The car will be polarizing for audiences, but in the long run I think Rocksteady will be commended for taking such a risk in design choice for the third game in their series. For the most part, Arkham Knight helps the trilogy avoid utter failure. While the game isn’t perfect, it does enough well to be just as engaging and intriguing as the previous two Arkham titles. I think that if Arkham Knight didn’t feature the Batmobile, it would feel too similar to Arkham City and leave a stale taste in the mouth of fans. After all, what’s the point of being Batman if you can’t drive his car? That isn’t a world I want to live in. Will Harrison is a reporter covering the games industry for The Toledo Blade in Toledo, Ohio who owns a pair of ‘Batman Begins’ boxers from 2005, and they are awesome. Contact Will @DoubleUHarrison or wharrison@theblade.com.